Why Can't Baltimore's Black Female Mayor Stop Saying 'Thug'? On Monday night, protesters took to the streets of Baltimore hours after the funeral of Freddie Gray, a young man who died following injuries he sustained while in police custody. 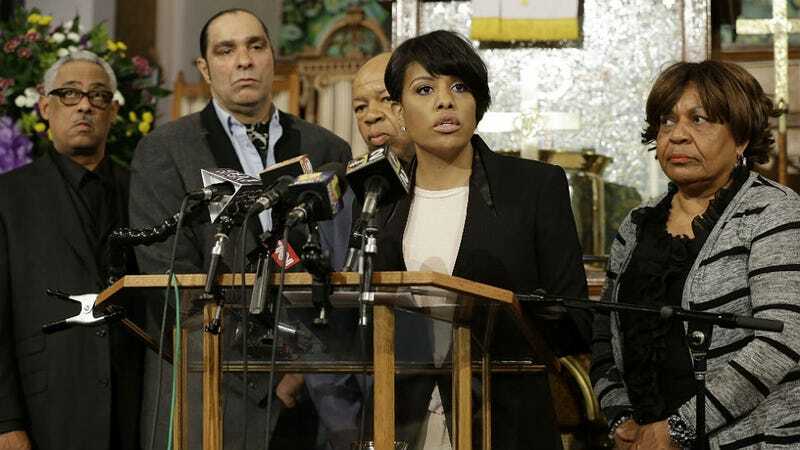 Last night, Baltimore’s Mayor Stephanie Rawlings-Blake stood before news cameras, asking for peace and calling the protesters “thugs,” all without acknowledging the root of the problem—cops who think breaking a suspect’s spine by driving too fast in a squad vans is acceptable. And who’s telling them it isn’t? At the Baltimore Sun, Doug Donovan and Mark Puente wrote about the many other victims of Baltimore police department’s “rough rides,” described as when a person is cuffed and put in the back of a squad van, then driven around in such a reckless, fast manner that their body slams around the van’s walls, injuring them. This practice is “unsanctioned,” but clearly happens so often that the city has paid out millions to people like Alston who’ve been paralyzed and sometimes killed like Gray because of these “rides.” It would’ve been great if Mayor Rawlings-Blake mentioned that bit. Alston sued, and … A jury awarded Alston $39 million, but he and the city settled for $6 million. In settlements, the city generally does not acknowledge liability; the officers involved in the case did not face disciplinary actions. Alston’s attorney, Philip Federico, said Thursday that the Gray case brought back memories of Alston, who died about eight years ago. What jumped out was that both men had asthma and were denied when they asked police for inhalers, he said. The piece lists numerous other people who suffered this “rough ride,” like 27-year-old librarian Christine Abbott. Dehumanization is obviously the goal of the “rough ride.” Police instruct their suspect that they, the cops, hold the power over whether that person lives or dies in that moment and, whatever they decide, there will likely be no consequences. Mayor Rawlings-Blake could’ve said this also. However, the protests in Baltimore, and across the country, have shown that the assumption of no consequences is no longer viable, at least not in terms of social unrest. Police can no longer kill civilians with impunity and trust that they’ll be exonerated by a unequal legal system, or that everyone will just go home and forget about it. People are tired of being brutalized, tired of seeing a new victim’s name nearly every day, pairing that person’s senseless death with the name of yet another police officer behind the gun and in Baltimore, the wheel. Now, instead of head-shaking, there are protests and riots. When the system preaches peace but deals violently with its civilians, we see the emperor has no clothes on and the people take to the streets. Now, with all that you’ve just read, here’s what Mayor Rawlings-Blake did say via Twitter, which she doubled-down on during her press conference last night, posted above.